The main aim of the meeting was to discuss about CLLD multifund implementation and exchange views between the European Commission and ELARD on the renewal of European Structural Investment Funds framework for new programming period and explore mutual cooperation possibilities. 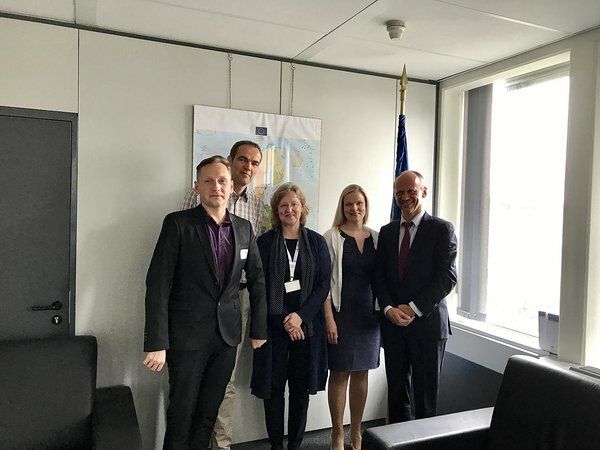 Commission was represented by Mr. Normunds Popens, DG REGIO Deputy Director-General, Mrs. Carole Mancel Blanchard, DG REGIO Deputy Head of Unit, and Mrs. Merja Haapakka, DG REGIO Policy Coordinator. ELARD was represented by its President Kristiina Tammets, Vice-president Pedro Brosei and Mr. Valdis Kudins, representing Latvian Rural Forum at ELARD. ELARD President Kristiina Tammets introduced European LEADER umbrella association and LEADER network that covers about 2000 LAG territories in 24 European countries. She also mentioned that additionally to rural LAGs some of our members also include Fisheries and Urban LAGs. In discussion we brought forward the meaning of LEADER method and the importance of bottom-up, its achievements, impact and potential with good practical examples. Tartu declaration was briefly introduced. Discussion followed with mapping the needs of different funds to implement local development strategies in rural areas. Using ERDF (European Regional Development Fund) and ESF (European Social Fund) could enable to support more rural-urban cohesion and cooperation, social inclusion and different kinds of services could be expanded from urban to rural. Mr. Popens informed of the ongoing discussions at the European Commission between different General Directorates. DG REGIO needs more evidence and input from the local level of the real demand for ERDF contribution for LEADER/CLLD. They would like to know what kinds of activities are not covered by local development strategies today and where the ERDF support could be mostly used. Maybe ICT can be done with bigger support from the ERDF than currently? He emphasised that EU Regional Policy supports place based solutions and sees the need to strengthen connection with local level. CLLD is a good possibility for that. For ESF, Member States decide on resources mostly at state level. In spite of that he admitted that ESF could give added value to CLLD implementation. Mr. Popens also highlighted the need for harmonization of the different fund rules in future. Member States can do a lot at national level for simplification and better coordination between all actors implementing multi-fund CLLD. The multi-fund approach was voluntary for Members States to choose for this programming period and 20 countries out of 28 chose to use it (according to Partnership Agreements). It shows that Member States see the value of that method and Commission certainly would like to support its implementation with simplified, harmonized framework and rules. DG REGIO appreciates proposals from the grass roots to improve the implementation of CLLD and looks forward to receiving further inputs from ELARD in this respect. DG REGIO would like to get information on what are the main complications related to multi-fund implementation, what could be simplified and what is the added value of ERDF support for rural areas. ELARD and Commission both expressed their wish and willingness for closer dialogue and cooperation in the process of renewing CLLD multifund for 2020+.